Since it was first suggested that the flickering star known as KIC 8462852 might be a Dyson Sphere, telescope-toting astronomers associated with the search for extraterrestrial intelligence (SETI) have been scouring the system for signs of aliens. Now, the most well-funded SETI program on Earth—UC Berkeley’s Breakthrough Listen—is getting in on the hunt, too. KIC 8462852, also known as Tabby’s Star but better known as the “alien megastructure,” has captivated the imaginations of astronomers and the space-loving public for about a year. The star, initially unearthed in the Kepler Space Telescope’s database, is acting astonishingly weird, its luminosity decreasing by up to 22 percent at seemingly random intervals before returning to normal. The star system’s total light output has also been diminishing slowly over time. Neither of these two phenomena is easy to explain on its own, and together, they’ve left baffled astronomers proposing all sorts of unlikely scenarios. Maybe the star is being occluded by a swarm of comets, or by the remnants of a shattered planet. Or, maybe, KIC 8462852's light output is dipping because an advanced civilization is in the process of constructing a giant artificial solar array to harness the star’s energy. You can imagine which of those scenarios the world has become obsessed with. To date, every single search for artificial signals from KIC 8462852 has turned up empty. Still, UC Berkeley’s SETI astronomers, who recently received a $100 million grant from billionaire internet investor Yuri Milner, can’t help but take a look for themselves. 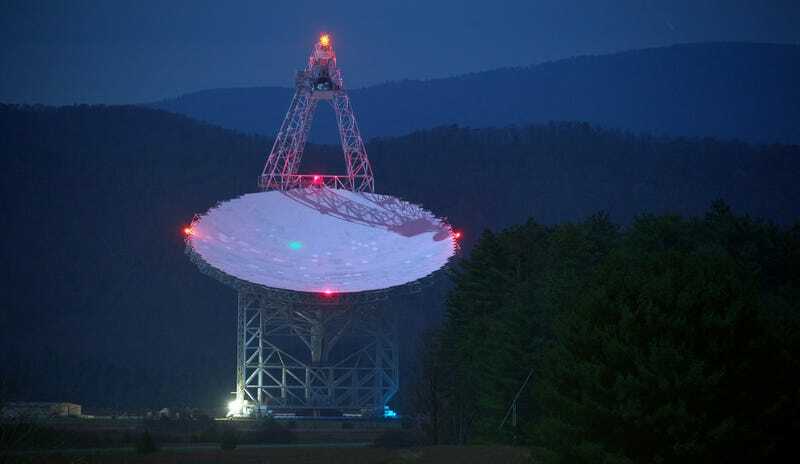 For three nights over the next two months, a team led by Berkeley’s Andrew Siemion will be listening to KIC 8462852 using the Green Bank Observatory in rural West Virginia, which Siemion describes as “the largest fully steerable radio telescope on the planet.” In other words, if there are interesting signals emanating from this region of space, the Green Bank Observatory is our best shot at detecting them. “We’ve deployed a fantastic new SETI instrument that connects to that telescope, that can look at many gigahertz of bandwidth simultaneously and many, many billions of different radio channels all at the same time,” Siemion said in a statement. One way or another, SETI won’t keep us waiting for long. The search begins tonight.